Need a lot of beds in a small space? 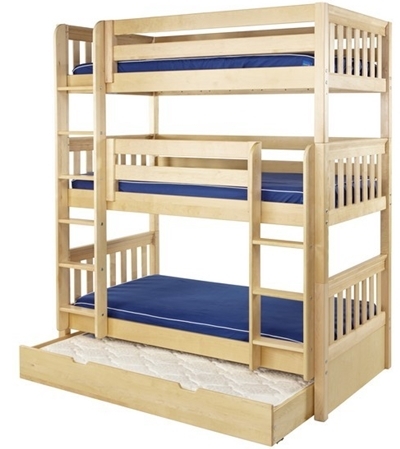 We carry safe and durable wooden triple bunk beds! These make a great bed for families with twins or children of different ages sharing a room. They are also wonderful for cabins, vacation homes, lodges, or wherever you need to sleep many in tight spaces. 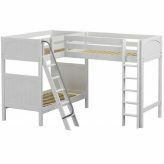 These sturdy triple bed bunk beds are built to last and withstand much wear and tear. They can be taken apart and used as single beds if need be. We have triple bunks that are stacked as well as triple bed L shaped bunk beds. Take into consideration your room size and ceiling height when selecting between the two. Our mattress covers, back pillows, and bolsters can turn any level into a cozy couch bed. So when you need to sleep three in one room, triple sleeper bunk beds will give ample sleeping space and free up the maximum room space.